Справка Zentimo - How to use skins? Справка > How to use skins? Everyone knows that every man to his own taste. So the skin supporting is one of the most important things to make the program to look like you prefer. 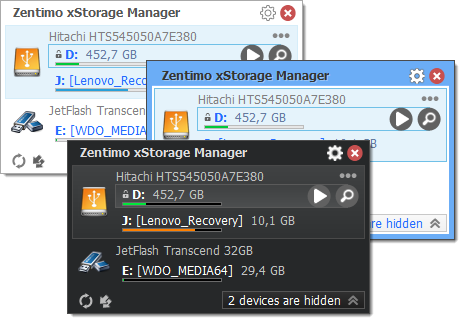 Zentimo supports skin changing for the stopping menu and some other frequently displayed windows. The current article describes how to use skins and how to create your own unique skin. Just go to the "Skins" tab of the program options, choose your the you prefer and click OK.
Easy, isn't it? Don't like any of the predefined skins and wish to make your own one? Create a new folder with the name of a new skin (e.g. "C:/Program Files/Zentimo/Skins/My Own Skin"). Create images following specified names using your favorite graphic editor. The easiest way to not miss an image is to copy all images from an existing skin folder to your new skin folder. Then you can edit just copied images in a graphic editor. If an image file won't find by the program it will be gotten from the default skin (it's named Default in the list of skins in the Options and actually is build into the program body so you may not see its folder and files). Create the text file "colorscheme.ini". This configuration file is used to define color and shape of the interface controls. Find the list of parameters and their description below. background - color of the window background. selecteditemtop - the top part of the device item gradient fill. selecteditembottom- the bottom part of the device item gradient fill. selectedsubitemtop - the top part of the drive item gradient fill. selectedsubitembottom - the bottom part of the drive item gradient fill. menuheadertext - the color of the header caption in the stopping menu and notification window. menuhighlight - the top part of the header gradient fill. menushady - the bottom part of the header gradient fill. menushadow - the color of the header underline. link - the reference link color in normal state. linkincontrol - the reference link color in mouse control state. itemtext - the color of the device name (the device item caption). buttontext - the color of the "Menu" button caption. hotkeytext - the color of the hot key text. hiddendeviceframe - the color of the frame around the hidden device list. selecteditemframe - the color of the device item frame. 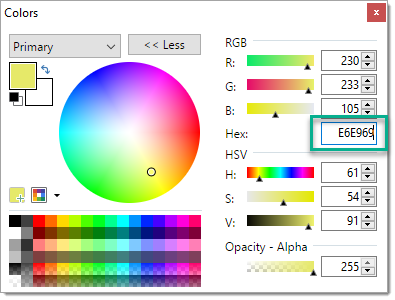 selectedsubitemframe -�the color of the device volume item frame. hiddendeviceshady - the bottom part of the hidden device list button gradient fill. readyforremoving - the "Ready for safe removal" text color. hiddendeviceincontrol - a bottom part of the hidden device list button gradient fill in mouse control state. hiddendevicehighlight- a top part of the hidden device list button gradient fill. scrollbarframe - the color of the scroll bar frame. scrollbarfill - the color of the scroll bar fill. scrollbarsliderframe -�the color of the scroll bar slider frame. scrollbargrad1 - a right part of scroll bar slider gradient fill. scrollbargrad2 - a left part of scroll bar slider gradient fill. scrollbarbtnframe -�the color of the scroll bar button frame. buttonframe - the "Menu" button frame color. buttonhighlight - a top part of the "Menu" button gradient fill. buttonshady - a bottom part of the "Menu" button gradient fill. buttonshadyincontrol - a bottom part of the "Menu" button gradient fill in mouse control state. windowlefttopadge - a top and left hand outside line color of the frame around window. windowrightbottomadge - a bottom and right hand outside line color of the frame around window. windowlefttopinneradge - a top and left hand inside line color of the frame around window. windowrightbottominneradge�- a bottom and right hand inside line color of the frame around window. windowfillframe - the color of the the frame around window fill. windowlefttopinneradge2 - the color of the line inside the frame around window at the top and left hand side. windowrightbottominneradge2 - the color of the line inside the frame around window at the bottom and right hand. windowhighlight - the color of a highlighted gradient fill of the frame around window. 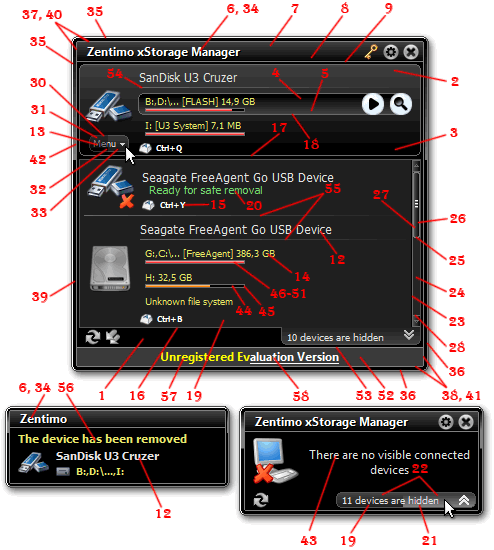 emptymenutext - the color of the text shown when there are no visible connected devices. progressbarfill - tbe color of a free space progress bar fill. progressbarframe - the color of a free space progress bar frame. freespaceemptydark - the color of the dark fill of the drive free space progress bar when a drive is empty. freespaceemptylight - the color of the light fill of a drive free space progress bar when a drive is empty. freespacemiddledark- the color of the dark fill of a drive free space progress bar when a drive is half-full. freespacemiddlelight - the color of the light fill of a drive free space progress bar when a drive is half-full. freespacefulldark - the dark fill color of a drive free space progress bar when a drive is full. freespacefulllight - the light fill color of a drive free space progress bar when a drive is full. infofill - the filling color of the stopping menu information panel. infoframe - the color of the the stopping menu information panel frame. showndeviceseparator - the color of the separating line between device items in the visible device list of the stopping menu. hiddendeviceseparator - the color of the separating line between device items in the hidden device list of the stopping menu. ballooncaptiontext - the color of the caption in the notification window. underlinedlink�- the color of the underlined reference link in the normal state. enablewindowframe - defines whether a window needs to have an around frame. enableitemchamferframe - defines whether items and sub-items of the stopping menu need to have a frame with chamfer corners. Note, the same format of the color is used in html markup and css styles.